Out with the old and in with the new, that’s what Ubisoft have done with a complete overhaul of the Rainbow Six series. Gone are the days of the Rainbow Six cover system and in comes the more familiar first person shooter feel with a more simple and standard aim down the sight system. Don’t be put of by the game going towards the normal FPS control system though, Rainbow Six Siege has an excellent game mode style similar to Search and Destroy. The beta only carried two multilayer game modes, as well as terrorist hunt for a bit of a co-op variety, accompany this with 3 maps and amazingly after a week and a half of solid playing, I still want to play more! The multiplayer mode is brilliant and builds on other game types from other games. As I said, it is similar to Search and Destroy from Call of Duty but unlike Call of duty, the bomb sites are not static and you are attempting to diffuse the bombs instead of destroying a cache. A rather unique way to start the game is by using the drones, the attackers are forced to search the building whilst the defending team prepares their defences and attempts to hide the bomb. This adds a pleasurable beginning and surprisingly intense start as you scramble around the building as quickly as possible. 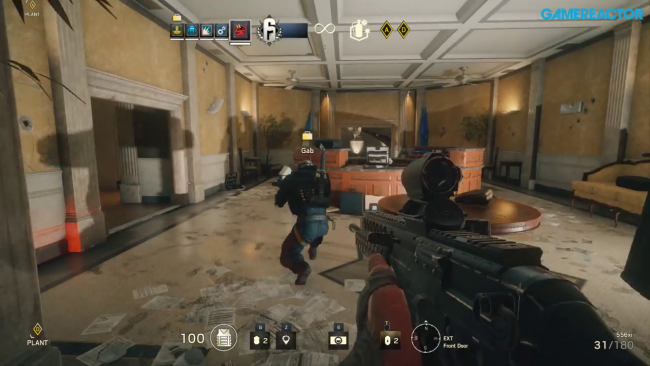 Rainbow Six Siege requires a slow gameplay, run around everywhere with speed and you might as well surrender before the game either begins. Teamwork is the key, along with using operators abilities to the maximum to make the perfect siege/defence. Rainbow Six operators have a good variety of abilities, there will most likely be a class that suites you perfectly, especially as more will be added at the full release! My only issue with the operators are the shield classes, it seems nearly impossible to take on one head to head, which in fairness is how it should be, but it is just frustrating! Finally terrorist hunt, its much easier with 5 people when you try realistic but even hard is quite hard (surprising!). I found the AI to be much improved for Rainbow Six Siege, a welcomed upgrade over the Rainbow Six Vegas terrorist hunt AI. You will feel rushed and pressured a lot during terrorist hunts as the AI vary between hiding and full out attack, you must also be very wary of the bomber who will come out of nowhere and suicide bomb you, yes you read that correctly. The intensity of terrorist hunt ensures that even when you don’t want to play online, Rainbow Six Siege has plenty to offer offline too. Rainbow Six Siege has made a great improvement to gameplay over the previous games, its more fun, easy to play and hard to master, the way a game should be. I played the beta for a week and a half pretty solidly with only 3 maps, so the full release having 10 maps and then free DLC means Rainbow Six Siege should be a must have this Christmas Season.